Decorate your home for Halloween in festive Snoopy and Gang style. 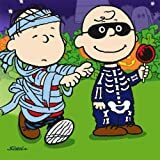 If you are a fan of Peanuts and Snoopy, you will find a large assortment of Halloween decorations on this page. These decorations will add a wonderful, festive look to your home and lawn décor. Some of the Peanuts Snoopy Halloween decorations here include handmade yard art, lighted decorations, garden flags, window clings and cardboard standup decorations. There is a full line of Peanuts Gang Halloween party supplies offered by the American Balloon Company. The party items include plates, table cover, cups, napkins, balloons, stickers and cupcake toppers. There are three fun designs to choose from. There are many Peanuts & Snoopy Halloween yard art decorations on the market. These fun Halloween decorations can be used year after year. The first yard art decoration is The Great Pumpkin. This decoration is made from brightly colored hammered tin and features Charlie Brown, Snoopy, Sally and Linus. It measures 60" and comes with an easel stand and four in-ground stakes. The next yard art decoration features an ever-hopeful Linus awaiting the arrival of the Great Pumpkin. It is also made of hammered tin and measures 19". 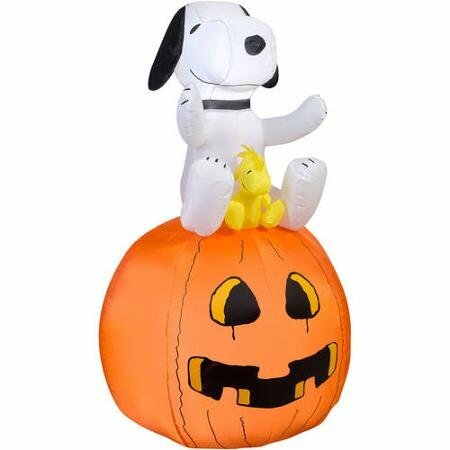 There is also a 42" Snoopy Jack-O-Lantern Lighted Halloween Yard Art decoration. It is UL Listed for indoor/outdoor use and includes ground stakes for secure placement. Ebay seller Sweet Pea 2 Us offers three awesome handmade Peanuts Halloween yard art decorations. The first is a 4-pc set which includes Sally, Linus, the Great Pumpkin and Lucy. The items in this set measure between 28"-36" tall and 21"-33" wide. The other decorations are 'Have a Cool Halloween' featuring Joe Cool and Snoopy & Woodstock in the Pumpkin Patch. Each decoration is hand cut, sanded and filled out of 1/2 inch exterior plywood. They are hand painted, detailed and sealed with 2 coats of a Polyshield. The back is primed and painted with exterior white paint. The yard decorations have a metal pole and brackets attached for easy displaying. Simply hammer the metal pole into the ground. No additional hardware or poles are required. 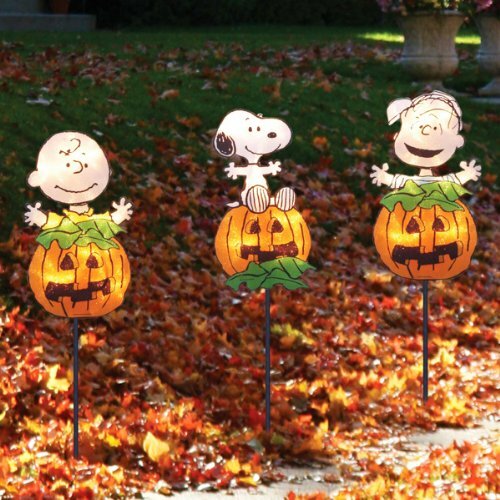 You can also purchase fun Peanuts Halloween lighted decorations and flags. There are two lighted decorations. The first is a 15" Charlie Brown Pirate Halloween window decoration. It features Charlie Brown with a sign that reads 'Beware'. It is illuminated with 20 clear mini lights and approved for indoor as well as outdoor use. The next lighted decoration is Vampire Snoopy sitting on a Halloween pumpkin. This decoration is 19" tall and comes with 25 lights. It has color enhanced glitter PVC gel and is approved for indoor and outdoor use. The Halloween decorative flags available include: Snoopy and Ghost Scare 'BOO! 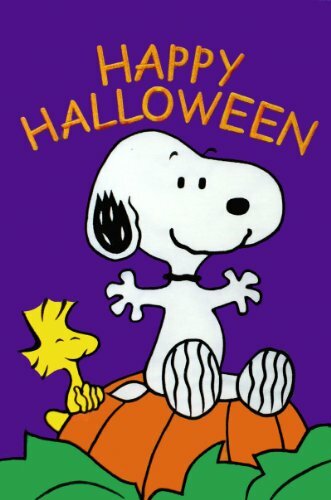 ', Snoopy & Woodstock, Linus Trick or Treat and Woodstock 'Gather Friends'. 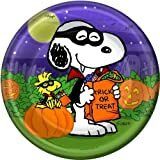 There are many Peanuts Snoopy Halloween window clings on the market for your home decor. Some of the designs include: Snoopy BOO!, Snoopy Halloween Scarecrow, It's the Great Pumpkin, Trick or Treat, Snoopy Vampire, Peanuts Gang, Snoopy Devil, Charlie Brown Vampire, Snoopy Vampire, Lucy & Snoopy and more. Some are classic vinyl window clings and others are the newer gel (Jelz) window clings. Advanced Graphics sells a Snoopy stand up decoration. The decoration is made of Solid corrugated cardboard construction. It can be mounted to a wall or door, or stand by itself. There is also a Peanuts Snoopy mini Halloween bulletin board set. This set would be perfect to decorate a school classroom or for your home decor. This Halloween set comes with 36 Die-Cut Illustrations, 36 Paper Cut-Outs and 2 Banners. 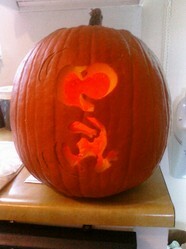 Lastly, there is an air blown Snoopy Halloween lawn decoration. It stands 4 ft tall and lights up and features Snoopy as the Flying Ace on a pumpkin. It is approved for indoor or outdoor use. This Halloween, light up your garden with glowing pumpkins. Spooky, cute and eco-friendly, all at the same time! A look at the fun and funky yard decorations for Halloween, SkeleMingos and DevilMingos. A new twist on the familiar pink flamingos dressed for the holiday.